Ventraip Review 2019: Is Ventraip a Good Hosting? Ventraip is a leading Australian web hosting company that provides secure VPS and domain name registration services at competitive prices. With a friendly local support team and stable servers, VentraIP offers customers good value for money. Founded in 2010, Ventraip is a privately-owned hosting company that serves over 150,000 customers in Australia. They offer a range of solid web hosting and virtual servers along with domain registration and SSL certificates. VentraIipis a good choice for anyone who’s looking for a Managed VPS service. Optimized for speed, their SSD virtual servers can meet the diverse needs of modern businesses. Overall, their hosting environment is user-friendly and secure. They use dynamic security rules, such as CXS, LFD, CSG, and CageFS to protect your websites. They also have a 45-day money back guarantee. With scalable hosting packages, VentraIP lets you add resources to your online services in order to meet the growing needs of your business. You can buy more storage space, email boxes, SSL certificates, add-on domains, databases, and increase your CPU speed. VentraIP gives you three options under shared hosting. The basic package is the Starter plan. It’s suitable for anyone who has started a personal blog, a small store, or a new business website. With this plan, you get 5 GB storage in SSD and a CPU allowance of 2GB. If you want to build an online gallery or a website for an established business, you may want to consider the Freedom plan which comes with 15GB storage and a memory allowance of 4GB. If you want to transfer to a high traffic site that is built on WordPress, or Moodle or Magento, the best option for you is the Premier plan. With it, you get 25GB SSD Storage and a memory allowance of 6GB. The added advantage is the free priority support. Ventraip doesn’t discriminate when it comes to goodies. All their hosting plans include unmetered bandwidth, unlimited MariaDBs, unlimited email accounts, unlimited add-on domains, regular backups, and free Comodo SSL Certificates. You can unlock these features by signing up and paying for your hosting account. Their shared hosting plans are reasonably priced. With multiple options, you can find one that is within your budget. I had an easy time comparing plans as they’re all laid out in a table. ID protection comes free as an add-on. Their VPS is quite expensive though. I believe you can get one with similar specs at a lower price. With five billing cycles, Ventraip lets you choose the one that suits you best. You can conveniently pay using PayPal, BPay, credit card, or EFT bank transfer. Customers enjoy real-time local support at all levels. You have the option to open an eTicket, send a message via the online contact form, or call the support team that is available 24/7. From migrating your websites or databases to configuring your new VPS, the support team will handle your case in a timely and professional manner. Are you a hands-on person? Ventraip also has a Support Center where you can learn the basics of troubleshooting, file management, website transfer, CMS, emails, logs, and backups. There are step-by-step guides and useful tutorials that will help you get a grip on their hosting features so you can administer your web space efficiently. For a reasonable fee, you can boost your CPU speed to meet increased traffic needs. You can also get additional 5GB storage and a dedicated IP address. Priority support is also available to customers who want ongoing security monitoring, performance optimization, and software updates. 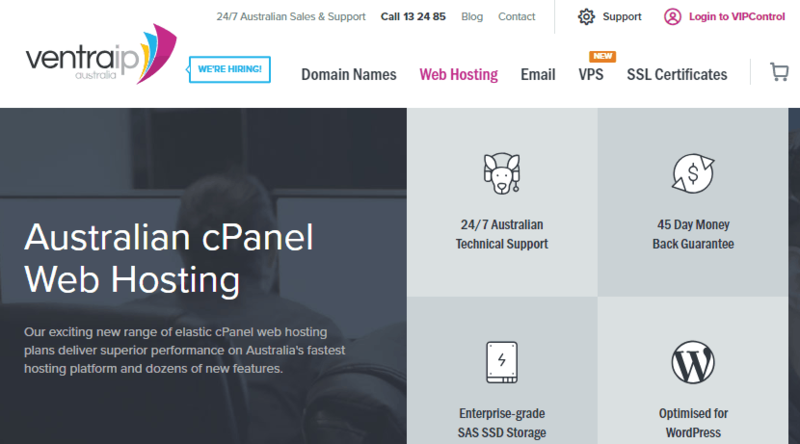 onClick="trackClickout('event', 'clickout', 'Vendor Page - Visit User Reviews', 'Ventraip', this, true);"
If you’re looking for a top Australian hosting company with feature-rich hosting plans and fully-managed SSD VPS, Ventraip is a solid choice. They provide 24/7 support via multiple channels. Wondering how Ventraip stacks up against other Web Hosting companies? Enter any other Web Hosting company and we will give you a side-by-side comparison.